The Palestinian Central Bureau of Statistics (PCBS) has revealed that the percentage of the population of refugees in Palestine has reached 42.5% of the total Palestinian population, in 2017. PCBS revealed, according to Al Ray Palestinian Media Agency, that 26.6% of the population in the occupied West Bank are refugees, while the percentage of refugees in the Gaza Strip is at 66.2%. PCBS pointed out, in a report it issued on Wednesday, the International Day of Refugees, that the Palestinian Nakba (“catastrophe”) describes a process of ethnic cleansing in which an unarmed nation was destroyed and its population systematically displaced by another nation, resulting in a total displacement of 800 thousand, out of the 1.4 million Palestinians who lived in historical Palestine in 1948, in 1,300 villages and towns. PCBS added that several official estimates on the number of Palestinian refugees, on the eve of the 1948 war, were released from various sources. However, the United Nations released two estimates: the first referred to the number of Palestinian refugees, amounting to about 726 thousand refugees, as based on the estimates of the United Nations in 1949. The second count amounted to 957 thousand refugees, as based on estimates of 1950. United Nations Relief and Works Agency (UNRWA) records indicate that the number of registered Palestinian refugees in 2017 amounted up to about 5.9 million, and these figures represent the minimum number of Palestinian refugees, according to PCBS. 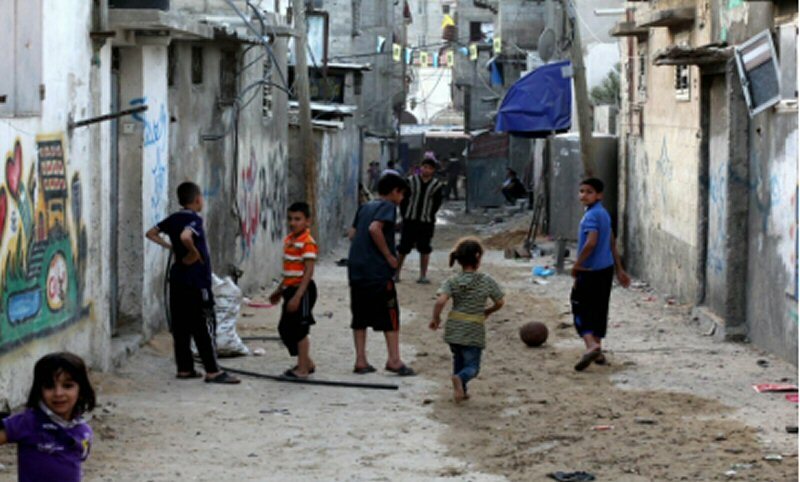 It showed that Palestinian refugees in the occupied West Bank, who were registered with UNRWA in 2017, accounted up to 17.0% of the total refugees registered with UNRWA, against 24.4% in the Gaza Strip. At the level of the Arab countries, the percentage of Palestinian refugees registered with UNRWA in Jordan, amounted up to 39.0% of total Palestinian refugees, while the percentage of Palestinian refugees registered with UNRWA in Lebanon and Syria reached 9.1% and 10.5%, respectively. The report showed that the percentage of persons aged less than 15 years, in Palestine, reached 39.9% (39.3% for refugees and 38.6% for non-refugees), in 2017, while the percentage of elderly (aged 60 years and above) among refugees had reached 4.9% of the total refugee population, while that of non-refugees reached 5.0%. Based on the data of the 2017 Population, Housing and Establishments Census, 6.8% of Palestinian refugees suffer from some disability or difficulty, as compared with 5.1% among non-refugees. On the types of disabilities/difficulties between refugees and non-refugees, it was found that the number of individuals who suffer from an inability to see was higher among refugees compared to non-refugees, at 3.1% and 2.3% respectively, while the proportion of people with disabilities or difficulties in movement, among refugees, was 3.5%, compared to 2.5% among non-refugees. PCBS reported that the poverty percentage among refugees was at 38.5% during 2017, according to monthly consumption patterns, which means that the monthly consumption of their households was below the poverty line, this being the equivalent of approximately 2,470 NIS for a Palestinian household of 5 (2 adults and 3 children), while the percentage among the non-refugees was 22.3%. It was added that the percentage of refugees who suffered from deep poverty was 23.0%, meaning that their monthly household consumption was below the deep poverty line, which was 1,974 NIS for a Palestinian household of 5 (2 adults and 3 children), while the percentage among the non-refugees was 12.2%. Furthermore, the poverty percentage among refugees was higher than the general average. And, the percentage of poor individuals in Palestine was counted at 29.2%, while the percentage of individuals who suffered from deep poverty was 16.8%, in 2017. The results of the Labor Force Survey, in 2017, showed that the participation rate in the labor force, among refugees aged 15 years and above who reside in Palestine, was 45.2%, against 45.3%, for non-refugees. In the same context, the data indicated that there is a clear difference in the level of unemployment rate among the individuals participating in the labor force who are aged 15 years and above, between refugees and non-refugees, as the unemployment rate among refugees reached up to 34.7%, compared to 22.8% among non-refugees. The percentage of employed persons in the West Bank among the individuals participating in the labor force (15 years and above), for the year 2017, reached 57.6%, with a clear difference according to refugee status. The percentage of employed refugees was 40.3%, while the percentage for non-refugees was 67.9%, whereas the percentage of employed persons in Gaza Strip was at 29.4% (about 52.3% for refugees, compared to 15.8% for non-refugees), and the percentage of those employed in Israel and its settlements was 13.0% (7.4% for refugees compared with 16.3% for non-refugees). The PCBS data also indicated that the percentage of illiteracy among Palestinian refugees in 2017, for individuals aged 15 years and above had reached 3.0%, while, among non-refugees, the figure reached 3.6%, and the percentage of Palestinian refugees (aged 15 years and above) who obtained a bachelor’s degree or higher had reached 18.1 % of total refugees aged 15 years and above, against 16.6% for non-refugees. Also, the socio-economic conditions of Jordan’s Palestinian refugee camps study, in 2011, which was prepared by FAFO, showed that 39.9% of the individuals residing in these camps were under 15 years old, while the percentage of elderly (65 years and above) was at 4.3%. The data also indicated that the percentage of illiteracy among individuals in the camps, aged 15 and above, ranked at 8.6%. In addition, the statistics for Palestinian Refugees in the Palestinian Refugee Camps and Localities Census in Lebanon, for 2017, showed that the Palestinian refugees in Lebanon are concentrated in Sidon (35.8%), followed by the North (25.1%), Tyre (14.7%), Beirut & its suburbs (13.4%), Al Chouf (7.1%) and Bekaa (4%). The results indicate that about 7.2% of Palestinian refugees aged 10 years and above are illiterate (unable to read or write), while the percentage of enrollment in education, for individuals from 3-13 years, was 93.6%. And, the percentage of those holding a university degree was 10.5%. Also, the results showed that the unemployment rate among Palestinian refugees aged 15 years and above, in Lebanon, was 18.4% of the individuals participating in the labor force. And, the rate of unemployment among the young (15-19 years) reached 44%, while the unemployment rate was 29% for individuals aged 20-29 years.